Nearly all tobacco products, from cigarettes to chewing tobacco, contain at least a small amount of menthol. Menthol is a minty flavor, either found in plants of the mint family or produced synthetically. Menthol masks the harshness of smoking and provides a cooling sensation. The price for menthol cigarettes is cheaper in African American communities and poor communities, compared with more affluent communities with fewer African Americans. 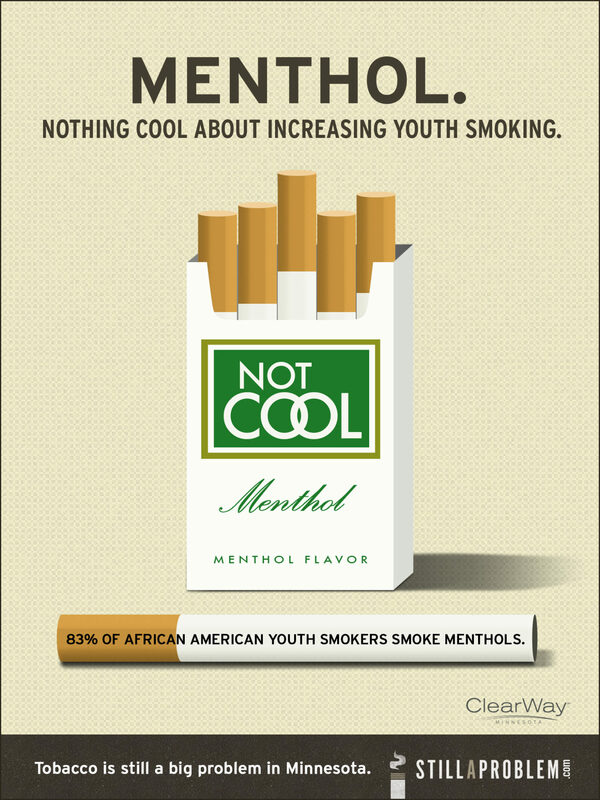 The proportion of advertisements for menthol products increases as the proportion of African Americans in the community increases. The advertising campaigns often feature urban culture and language designed to target African Americans. The tobacco industry sponsors hip-hop bar nights where they provide samples of specialty menthol cigarettes. As a result, menthol cigarettes are smoked at much higher rates among African American smokers (82.6%), compared with White smokers (23.8%). Tobacco products such as electronic cigarettes, cigars, little cigars and cigarillos, chewing tobacco, snus, etc. often resemble candy, both in flavoring and packaging. These products and the marketing tactics accompanying them, promote tobacco use among children and youth. Sold in brightly colored packaging, these tobacco products often come in fruit, candy and alcohol flavors, which can mask the harshness and taste of tobacco and appeal to youth. These tobacco products are frequently sold in small pack sizes, such as 2 little cigars, that are more appealing to youth. [pictures of products/packaging] Many of the newest products, like snus, are products that are very inconspicuous and are marketed as being a strategy to evade smoke-free or tobacco free policies. 50% of Menthol Smokers in Minnesota Would Quit Smoking if Menthol Cigarettes Weren’t Sold in the U.S.